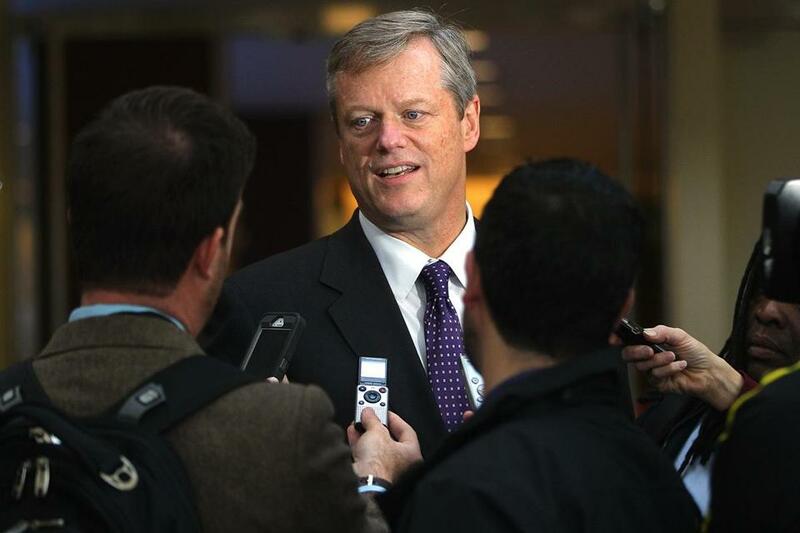 The visit gives Charlie Baker a chance to show gratitude to the Republican Governors Association. Governor-elect Charlie Baker tiptoed Wednesday into national Republican politics, joining a Florida confab of the party’s governors, an early sign of the limits to the distance between himself and a world he actively shunned during the campaign. Baker planned a two-day visit to the Republican Governors Association annual conference during a break from a postelection vacation with his wife, Lauren. His transition team, after not responding to multiple inquiries Tuesday night, did not disclose the closed-door governors association meetings until after the Globe published a story about the trip online Wednesday morning. A Baker spokesman said the team had always intended to apprise the media of the political leg of the trip. “Governor-elect Baker will discuss successful strategies to create jobs and improve public education with fellow governors and plans to talk about his successful strategy to build coalitions around a positive campaign message and moderate ideals,” Baker spokesman Tim Buckley said in an e-mail. Accompanying Baker to the meeting are his campaign manager, Jim Conroy, and top strategist Will Keyser, Buckley said. The visit also gives Baker a chance to show gratitude to the organization, which spent more than $11 million on his behalf, funding attack ads against his election opponent, Democratic Attorney General Martha Coakley. The governors association meeting is serving as something of a proving ground this year for some of the GOP governors eyeing the White House in 2016. Among them: New Jersey’s Chris Christie; Wisconsin’s Scott Walker; Louisiana’s Bobby Jindal; Texas’s Rick Perry; and Indiana’s Mike Pence, one of a handful of national figures Baker said called him in the days immediately after his victory. During the campaign and in public statements since, Baker has worked to cultivate a bipartisan profile. He has hired Democrats to serve as his chief of staff and secretary of housing and economic development. But during the campaign Baker also became embroiled in a controversy with Christie, an ally who is the outgoing chairman of the governor’s association and for whom Baker has expressed personal affection. A report is still pending from the New Jersey state treasurer’s office on the legality of a $10,000 donation from Baker to the New Jersey Republican Party, in the context of an investment deal between that state’s pension fund and Baker’s venture capital firm. And Baker’s dalliance with his party’s presidential hopefuls, some of whom will work to court its most conservative factions, underscores the boundaries of Baker’s efforts to wriggle out of a partisan profile. The state Democratic Party on Wednesday pounced on Baker’s trip to issue its first public criticism of the governor-elect since his win over Coakley. As the GOP turns to the 2016 election cycle, with a relatively wide-open presidential primary taking shape, Baker could also prove an attractive dance partner: He is one of the few prominent Republican officeholders in the Northeast, and governs a state adjacent to New Hampshire, site of the first primary in the nation. Chairing the governors association served as a platform for the state’s last Republican governor, Mitt Romney, to build his national profile by touring the country in support of other gubernatorial candidates. Its meetings typically offer politicians who spend most of their time in the their home state access to the party’s top fund-raisers and operatives. In an interview two days after the election, Baker downplayed his interest in national politics, and said he had not considered whether to attend the Republican convention in 2016. “I would hope that one of the lessons that some of the Republicans nationally would take from this race is that it’s a good idea to chase 100 percent of the vote and to make the case in as many forums and as many places as they possibly can,” Baker said. The Bakers paid for their airfare, while the Republican Governors Association footed the tab for their stay at the Boca Raton Resort and Club, where the meeting is being held, Buckley said. Buckley said it was the first vacation the Bakers have taken for more than a night since they had children, the oldest of whom is 24 years old.